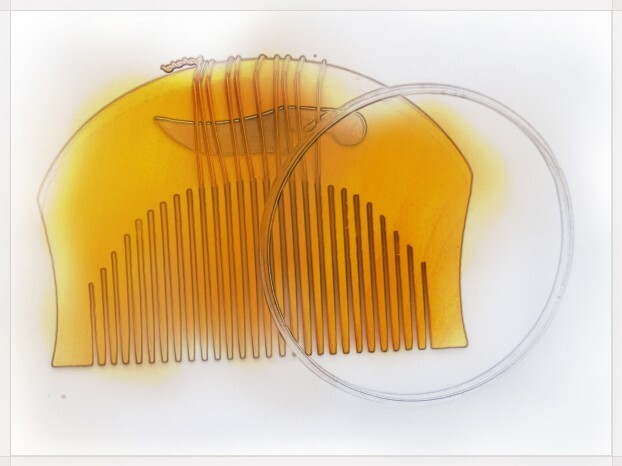 The Kanga is a wooden comb and is one of five kakar, articles of faith, required for a Sikh. The kanga is commonly carved from rose wood or sandal wood anywhere between 2-6 inches in size. The kanga is worn in the joora, the topknot of unshorn hair of the Amritdhari. The kanga is used twice daily to comb and to clean the kes, the hair. The kanga is worn in the hair under under turban or keski a kind of under turban, and is kept on the person at all times. Namdhari Sikh kangas have a steel Sword and khanda pinned on either side. Hearing the word "Panj Kakars" we know that every Sikh is suppose to adorn the kakars all the time. But do you know the history behind the use of Kakars ? At the time of Guru Tegh Bahadur Ji (the ninth Guru of the Sikhs), many Hindus were forced to become Muslims by the Mughal Emperor, Aurangzeb. In order to protect the Hindus Guru Tegh Bahadur Ji had to sacrifice his life. Therefore, to make his Sikhs become brave and protective and to make them look unique, Guru Gobind Singh Ji (the tenth Guru of the Sikhs) once called all the Sikhs to gather at Anandpur Sahib on 13th April 1699. There, he asked for the ones who could sacrifice their life for the religion. Out of whole lot of people only five people responded, they were ; Bhai Daya Ram, Bhai Dharam Chand, Bhai Muhakkam Chand, Bhai Sahib Chand and Bhai Himmat Rai. Although these five people were from different caste they still gave respect to Guru Gobind Singh Ji's words. Thereafter, Guru declared those five people as the beloved ones or "Panj Pyare" by letting them have Amrit (Holy water). Then he himself had Amrit and annouced that every male Sikhs should add "Singh" after his name. In addition, he made his Sikhs look unique and made them brave by introducing 'Panj Kakars' in order to protect themselves. In other words : "Singhs and Kaurs with Panj Kakars are brave and unique". He made his people learn to fight against injustice. Therefore, we as the disciples of our Guru, repecting his words, should try to keep all the kakars. Unfortunately, nowadays, people have very rare knowledge about the Panj Kakars. Whereas a people can be called a Sikh only if he fulfills his duty by just obeying Sri Satguru Ji's words and teachings. The most important is that everyone should look upon himself whether he adorns all the five Kakars ? Sometimes called simply the 5 K's. A Sikh is required to wear all of the 5 K's during the Sikh baptism, or initiation ceremony of Amrit, and there after. The articles are to be kept on or with the person at all times. Because the name of each one of the five articles begins with the letter (or sound of) K, they are commonly called the five K's or kakar(s). The kakar each have a practical function. The Kachhera is an undergarment and is one of five kakar, the articles of faith, required to be worn by Sikhs. The kachhera may be sewn from any white cloth but is most commonly cotton or poly blend. The kachhera is cut on the bias and is tied with the nala, a drawstring fastening. The kachhera is from one to three yards in width and is not to come below the knee. The kacheraa is to be worn on the body at all times. The Kara is a steel or iron bangle worn on the wrist and is one of five kakar, the articles of faith required to be worn sikhs. The kara is a bracelet made of pure steel or iron. The kara is to be worn on the body at all times. Kes is the Sikh word for hair. Kes refers to unshorn hair or unaltered intact hair and includes all hair on the head, face and entire body. Sikhs honor the intention of the creator by keeping their hair unshorn and unaltered in its natural state. Hair is to be kept clean and combed, and kes ought never to be cut, colored, or curled. Shaving, plucking, tweezing, waxing, bleaching, using depilatories, or otherwise altering the hair by any means, dishonors the kes and the inherent intention of the creator. Kes is essential to Sikhism as belief the guidelines of the gurus teachings and initiation according to tenth Guru Gobind Singh is part of what defines a Sikh. Kes is to be maintained and kept intact from birth throughout the entire life until death. A Sikh who maintains kes, keeping all hair unshorn and intact, is known as a Kesadari (Unaltered (entire) body hair). Sikhs use a wooden comb called a kanga to keep the Kes free from tangles. The Kes is kept up and covered with a length of dastar (turban) to protect it. A Kirpan is a Sikh sword. The kirpan is one of five kakar, or articles of faith, required to be worn by all Sikhs. The kirpan may be made of either steel or of iron. The kirpan historically was used for defense in battle and may be used in as a weapon only for self defense or to defend another innocent person from harm. Symbolically the kirpan is a reminder to the spiritual devotee to slay the ego. The kanga with the kirpan is to be worn on the body at all times.